Prominent board members of the World Editors Forum (WEF) have resigned their posts and re-grouped to form a new international network for editors from all mediums in response to the rapid acceleration of media convergence. The Global Editors Network (GEN) will be headed by former WEF president Xavier Vidal-Folch, deputy director of the Spanish daily newspaper El Pais and former vice-president Harald Stanghelle, political editor of the Norway’s largest newspaper, Aftenposten. Both men, who will remain on the WEF board, will hold the same positions as they previously held in the newly-formed GEN, which is to be officially launched on 23 March 2011. Vidal-Folch and Stanghelle both resigned their posts from the WEF board on 14 February 2011, according to WEF’s website. The same page shows that Roman Gallo, the founder of now defunct hyperlocal newspaper project the Naše Adresa in the Czech Republic, resigned on the same day. And, earlier this month, WEF director Bertrand Pecquerie also stepped down. A full list of the GEN Board members and founding members will be released on launch, according to its website. A source told Journalism.co.uk that the aim of the new organisation is to gather editors from all platforms (print, broadcast, online, mobile and wire services) and to create an “Editors’ Lab” for new editorial services and new applications. We, the editors-in-chief and senior news executives founding the Global Editors Network (GEN), are convinced that news producers and newsrooms across all platforms – print, broadcast, online, mobile and wire services – face comparable challenges. Because digitalization and broadband access accelerate media convergence, we are members of the same community, all driven by a journalistic imperative and a common goal: Content and Engagement First! reinforce the pillars of credibility of our profession based on context, accuracy, relevance, reliability, loyalty to the audience, effectiveness and connectedness, as citizens’ distrust is the main threat for our civil societies. Interested parties are invited to contribute to the manifesto here. You can also follow GEN on Twitter @EditorsNet. The World Association of Newspapers (WAN), the parent organisation to WEF, merged with IFRA, the worldwide news research and services organisation, in June 2010. This entry was posted in Multimedia, Newspapers, Online Journalism and tagged Bertrand Pecquerie, Global Editors Network, Harald Stanghelle, Roman Gallo, World Association of Newspapers, world editors forum, Xavier Vidal-Folch on March 16, 2011 by John Thompson. The World Association of Newspapers (WAN) has written to Burma’s military junta asking for the release of two Burmese journalists and an end to the repression of journalists working in the country. According to reports, journalist Ngwe Soe Lin was sentenced to 13 years in prison on 28 January after sending reports to the Norwegian-based broadcaster Democratic Voice of Burma (DVB). Lin’s sentencing follows the 20-year punishment handed out to journalist Hla Hla Win late last year. This entry was posted in Editors' pick, Press freedom and ethics and tagged Asia, Burma, Hla Hla Win, myanmar, Ngwe Soe Lin, WAN, World Association of Newspapers on February 4, 2010 by Laura Oliver. Rupert Murdoch gives the preface to this year’s World Association of Newspapers (WAN) Innovations in Newspapers 2009 World Report. 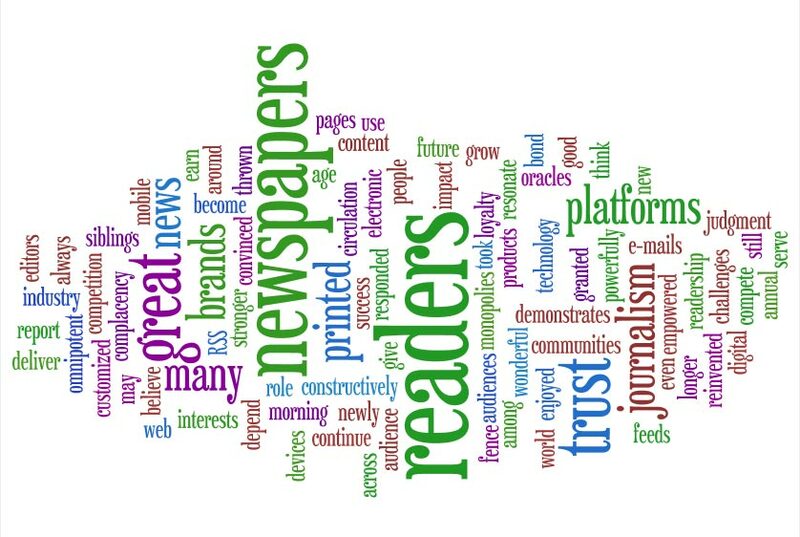 Below is a Wordle of Murdoch’s comments (as quoted in a WAN release), in which he said readership would grow for news consumption across print, social media and online outlets. This entry was posted in Journalism and tagged online outlets, Rupert Murdoch, social media, WAN, World Association of Newspapers on April 28, 2009 by Laura Oliver. 70 journalists were killed worldwide in 2008, the World Association of Newspapers (WAN), said in a release today. The journalists and other media employees were killed worldwide ‘because of their professional activities in 2008, with the conflict in Iraq continuing to be the most deadly assignment for journalists’ the release said. WAN said that several press freedom organisations track the number of journalists killed each year. “The numbers vary based on the criteria used by different associations. WAN’s figures include all media workers killed in the line of duty or targeted because of their work. It also includes cases where the motive for the killings is unsure or where official investigations have not been completed,” the release explained. This entry was posted in Media releases, Press freedom and ethics and tagged Iraq, journalists, media employees, media workers, online list, WAN, World Association of Newspapers on February 11, 2009 by Judith Townend. “Six of the world’s leading newspapers dedicated to sport have come together to form the International Association of Sports Newspapers (IASN), to defend and promote the interests and freedom of the sports press,” the World Association of Newspapers (WAN) announced on Friday. Full release at this link. This entry was posted in Journalism, Media releases and tagged iasn, International Association, international association of sports newspapers, sports journalism, WAN, World Association of Newspapers on February 9, 2009 by Judith Townend. “Delegates to the Arab Free Press Forum have condemned travel restrictions imposed by authorities in several Arab countries that prevented some speakers and participants from attending the event,” reports the World Association of Newspapers. Several journalists who were due to participate were prevented from travelling from Egypt, Tunisia, Qatar, Libya and Syria. This entry was posted in Editors' pick, Events, Journalism, Press freedom and ethics and tagged Egypt, Libya, Qatar, Syria, travel restrictions, Tunisia, WAN, World Association of Newspapers on December 12, 2008 by Judith Townend. The World Association of Newspapers (WAN) and the World Editors Forum have written to the Chinese government about international standards of press freedom in the country. Laws in China restricting foreign journalists were temporarily relaxed during the Olympic Games in Beijing and have recently been extended by authorities. We are writing on behalf of the World Association of Newspapers and the World Editors Forum, which represent 18,000 publications in 102 countries, to welcome the extension of the relaxation in media regulations, but also to call on you to take further steps to uphold international standards of press freedom. In the run-up to the Beijing Olympics, your government introduced new rules that allowed foreign journalists greater freedom to travel in the country without prior government permission and to talk to anyone who was willing to be interviewed. Those regulations were set to expire on 17 October, however, shortly before they expired new regulations were introduced that recognise these rights. While welcoming the extension of the more relaxed regulations for foreign journalists, we are concerned that they do not extend to domestic journalists and that many fundamental rights necessary for the proper functioning of a free press are not observed. For example, there is no protection of news sources, it is not possible to report freely on Tibet and hotels are obliged to report the arrival of a foreign journalist to police. Furthermore, with more than 30 journalists and at least 50 cyber reporters imprisoned, China jails more journalists than any other. those detained for exercising their right to freedom of expression are immediately released from prison. This entry was posted in Press freedom and ethics and tagged Beijing, China, Chinese government, foreign journalist, Gavin O'Reilly, Gavin O'Reilly President, media regulations, Olympic Games, Olympics, Premier, the Beijing Olympics, the Olympic Games, Tibet, WAN, Wen Jiabao, World Association of Newspapers, Xavier Vidal-Folch, Xavier Vidal-Folch President on October 29, 2008 by Stuart Goodwin. Caroline Little, this year’s keynote speaker at the World Association of Newspapers (WAN) Digital Revenue Goldmine event, used her experiences at the Washington Post and Guardian to talk about the future of the web for newspapers. Most delegates had probably heard the sentiments of Little’s speech before, unless they’ve been living on another media planet for the past five years, but were eager to ask how she had implemented changes at her two workplaces. What was her budget? How would she have coped without the strength of brand? How to manage economically while making the changes? Little did not really give concrete examples and afterwards she told me it was perhaps too early in the day to talk specifics – she’s only been in the role at the Guardian since August. I’ll be sure to follow up with her in a few months time… The news report on her speech can be read here. This entry was posted in Events, Online Journalism and tagged Caroline Little, digital revenue goldmine, drg, Goldmine Caroline Little, guardian, International, keynote speaker, media planet, special advisor, The Guardian, The Washington Post, WAN, WAN Amsterdam, Washington Post, World Association of Newspapers on October 15, 2008 by Judith Townend. The World Association of Newspapers (WAN) has asked the Chinese government to extend its relaxation of media regulation beyond October 17. This entry was posted in Editors' pick, Press freedom and ethics and tagged China, Chinese government, media regulation, WAN, World Association of Newspapers on October 2, 2008 by Laura Oliver. European Union anti-trust watchdogs are investigating the proposed advertising deal between Google and Yahoo, which would see the two companies share some ad revenue. The World Association of Newspapers (WAN) has called on the EU to probe the tie-up, which Google and Yahoo have said would only come into force in the US and Canada. WAN said the deal would affect Yahoo’s ability to compete with Google in the future. This entry was posted in Advertising, Editors' pick and tagged advertising deal, Canada, Europe, European Union, google, proposed advertising deal, United States, WAN, World Association of Newspapers, Yahoo on September 16, 2008 by Laura Oliver.